Statement: After finishing BOHKYOH, which at the time I had thought was the most difficult project possible, I stopped thinking about reversible quilts for a while. However about a year later my interest reawakened. I had in the meantime accumulated more aizome, and from a friend had received some obi scraps which were beautiful, but extremely hard to quilt. 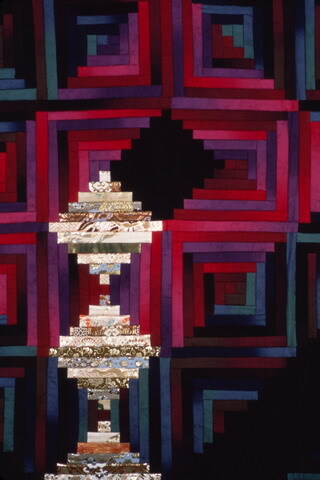 For that reason I began to think about a second reversible long cabin quilt. I was not yet able to calculate exactly how much fabric I would need for a reversible quilt, so I limited my choices to fabrics which I had in abundance. The design symbolized the aristocracy, its love of colorful display and elegance, expressed in silk (including an obi with gold thread) and some unusual Japanese cotton (which I received in America) with gradations of seven colors. The use of two different black fabrics (one cotton, one cotton satin) in the background produced a subtle contrast which apparently was very unusual in America at that time.